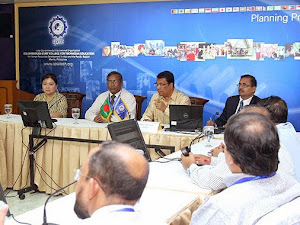 Twenty Six (26) officials from the Ministry of Education and Technical Schools in Bangladesh have been acquainted with the Asia Pacific Accreditation and Certification Commission (APACC) during their visit to Colombo Plan Staff College (CPSC) in Manila on May 14, 2015. The delegation, accompanied by the staff of the Technical Education and Skills Development Authority (TESDA), is the first of the three groups slated to arrive in the Philippines to attend a training and capacity building program organized by TESDA. They were warmly received in the headquarters by the CPSC team led by the Director General, Dr. Mohammad Naim bin Yaakub. During the opening ceremonies, he updated the audience of the recent achievements and programs of CPSC, particularly the upcoming International Conference on TVET Skills Development for Poverty Alleviation, Entrepreneurship and Employability on June 22 – 23, 2015 and first APACC Special Meeting on June 24, 2015. Both events will be hosted by CPSC in Manila, Philippines. Dr. Naim (center) welcomes the Bangladesh delegation during the opening program. He started his speech by giving a brief background about the APACC accreditation which covered the benchmarks, standards and the process undertaken by the commission in evaluating TVET institutions. He also cited the benefits of obtaining an APACC certification particularly workforce mobility and international recognition of the institution’s quality. He lauded Bangladesh’s efforts in further improving the situation of TVET in their country and encouraged the institutions that have previously obtained APACC certification to be renewed as soon as possible. Acknowledging Dr. Naim’s encouragement, the head of the delegation Mr. Md. Babar Ali (Director (P&D), Directorate of Technical Education, Bangladesh) expressed, with enthusiasm, his intention to prioritize APACC in his country. He further added that Bangladesh targets to have all of their TVET institutions accredited by APACC and he hopes to put forward the necessary arrangements as soon as possible. A speaker from the delegation seconded Dr. Babar Ali’s intention and hopes that the required funds will be allocated for institutions that will strive to undergo APACC accreditation. After the discussion and tea break, the delegates were toured around the APACC facilities in the college for a glimpse of the accredited institutions and achievements of APACC since its inception. The briefing and tour ended on a positive note in which both parties are hopeful on future endeavors that will spearhead the promotion of quality management and excellence of TVET in Bangladesh through APACC. 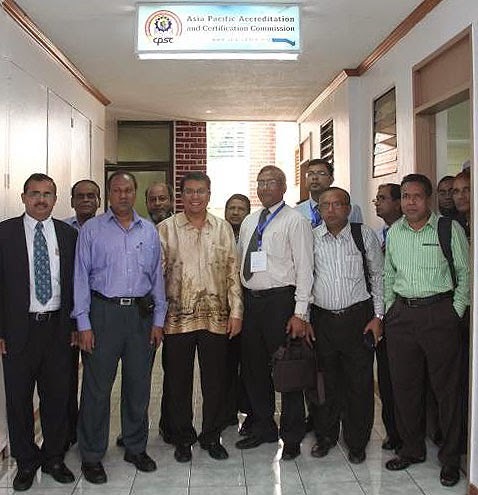 Dr. G. Kulanthaivel (CPSC Seconded Faculty Consultant, far left) and Dr. Naim (center) with the members of the delegation during a tour of the APACC facilities in the college.